As I entered the auditorium which the National Park Service had converted into a free interpretive center, this sign summed up the story. 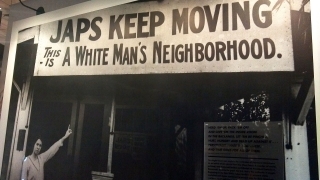 Past the gift shop, the first exhibit was quite shocking, laying bare the sentiments which led these events to unfold. 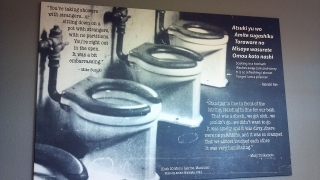 After the Japanese strike on Pearl Harbor, xenophobia and racism towards the Japanese were at a breaking point. There was a public call for action. 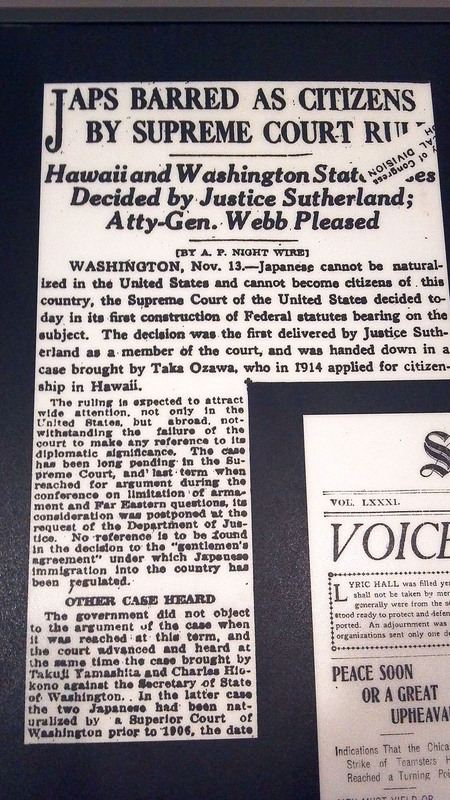 People felt that the Japanese represented a threat to national security. 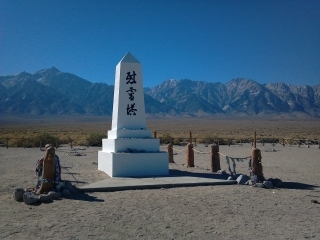 I’m not quite sure what I expected to find here at Manzanar, but it pulled no punches in its portrayal of the brutally toxic atmosphere that gave birth to Executive Order 9066, requiring all “persons of Japanese ancestry” to report for relocation. 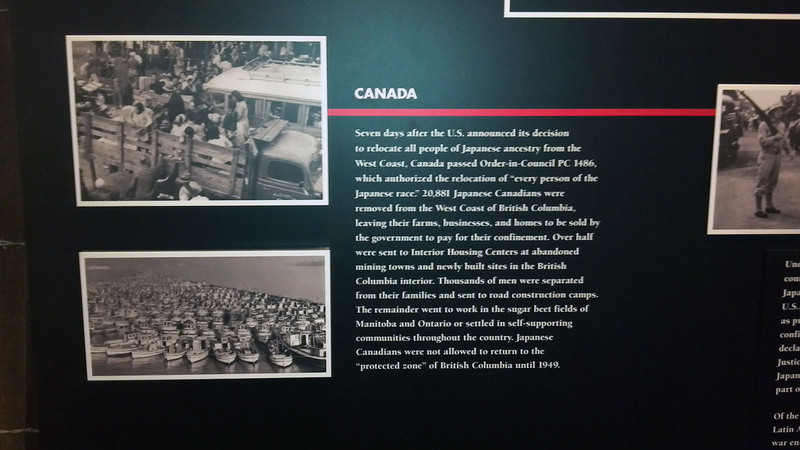 Canada and Latin America were not spared this tragedy. Later I discovered that unlike the Japanese, the Germans and Italians who were placed in internment camps have never received a federal apology or reparations. I found this interesting, because their incarceration hasn’t been highly publicized, almost as though we’ve forgotten about it. The stories told by Manzanar were heartbreaking. The detainees were given only a few days to prepare. They had to dispose of everything they owned, including their homes and businesses, often at fire sale prices – others knew they had to sell. They could bring with them only what they could carry, and nobody knew when they would be allowed to return. If they were lucky, they had non-Japanese friends who could manage their affairs while they were gone. Most ended up losing what livelihoods they had managed to scratch out of their new home country, some too elderly to start anew. Many buried or destroyed treasured possessions instead of selling them for a pittance. They were herded onto trucks and trains, under armed guard, and dispersed to the barren wastelands of the western states. 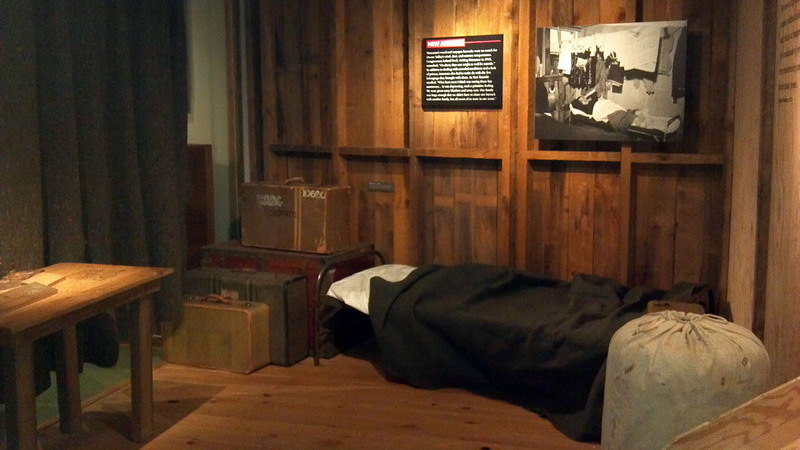 There they were crammed into hastily-constructed barracks, which they had to share with other families. They strung bedsheets from the ceiling as room dividers, in an attempt to create an illusion of privacy. The lack of privacy did not stop at the barracks, even the latrines and showers held no such luxuries. 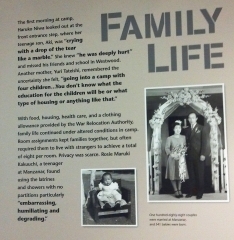 Many of the detainees’ worries centered around their children. Nobody knew what to expect, what kind of education their children would receive, or how they would be treated. The camp included a school, which had difficulty retaining teachers. Their sports teams were only allowed to play ‘home’ games, obviously. “I used to wonder how the children could get up and sing such patriotic songs. They would sing ‘I am an American’ and all the songs we sang in our schools.” – Former Inyo County superintendent of schools. 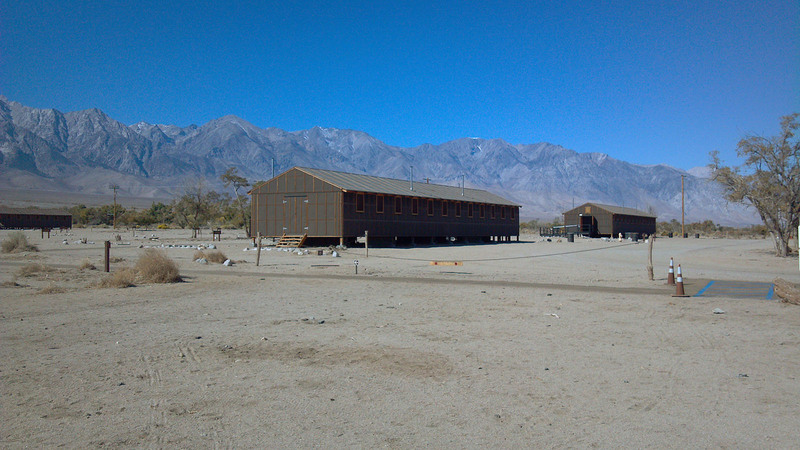 The camp also was home to 101 Japanese-American orphans at the Children’s Village. 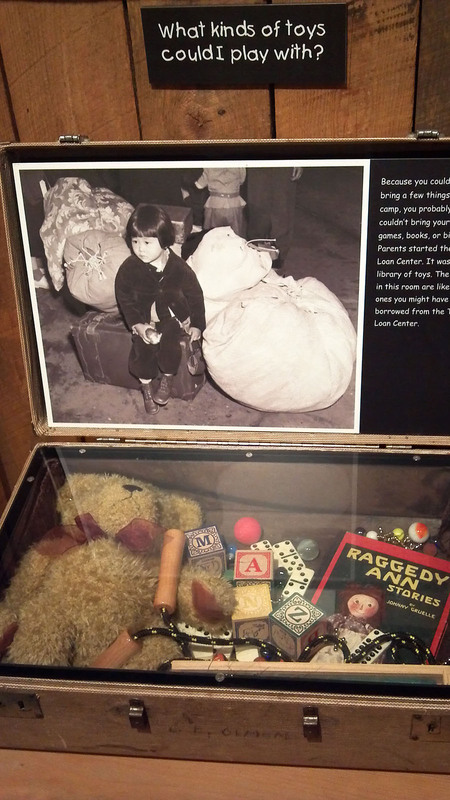 Half of the children came from institutions and foster homes, while others were separated from their families when their parents became ill, were arrested, or were the infant children of unwed mothers. 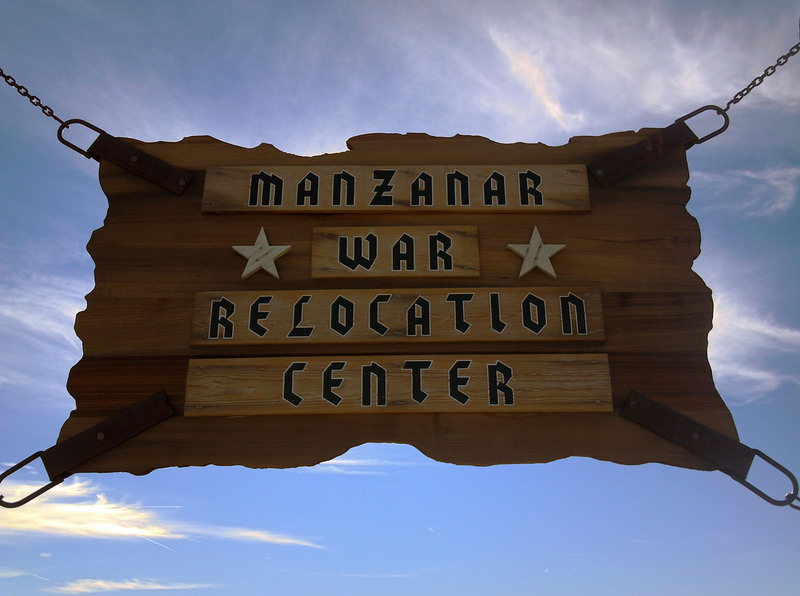 At Manzanar they became an unusual family, forming friendships and ties, only to be scattered and uprooted again when the camp was shut down. 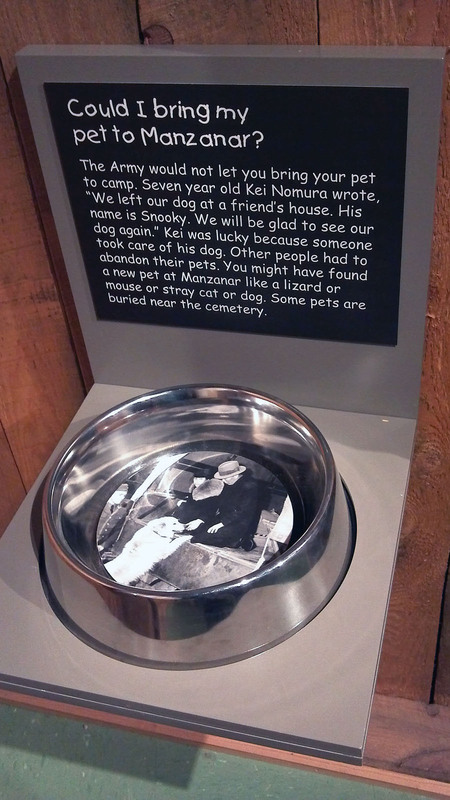 Also, the harsh reality that all of the families lost their pets when they had to evacuate. 21,000 young men were asked if they were willing to serve in combat. They didn’t know how their responses would be used, or how soon they would be inducted. 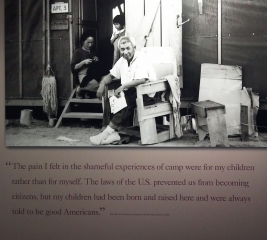 There was one sad story of a woman who saw her son volunteer for war and return to her in a pine box – she was given his purple heart while still locked behind a barbed wire fence. Several hundred men who refused to be drafted were convicted on federal charges. 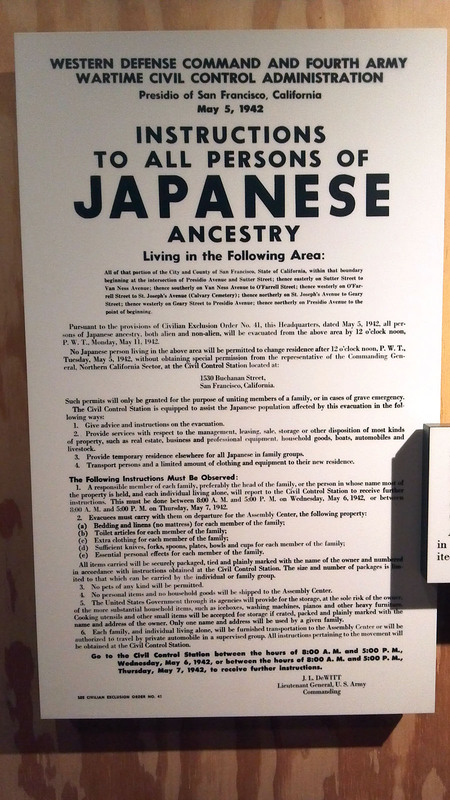 Most of the second-generation Japanese resented the implication that they had ties to the Japanese emperor, while first-generation Japanese were prevented by law from becoming American citizens. In essence, this question forced them to choose between appearing disloyal to their adopted country or renouncing their singular citizenship. 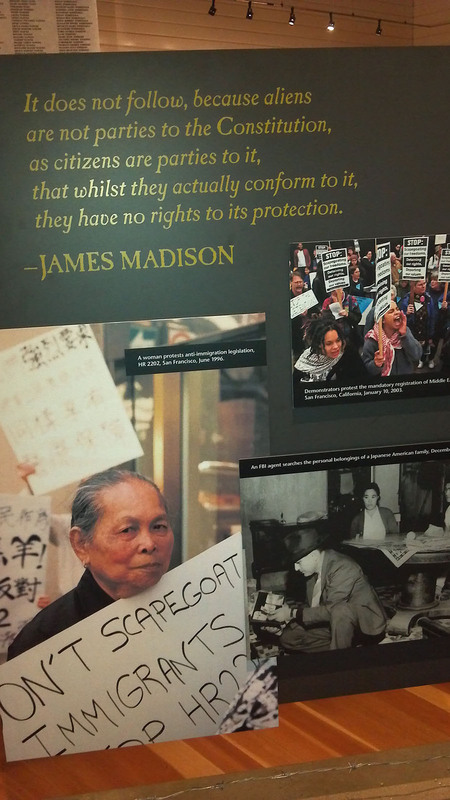 Many feared becoming stateless, having no country to call home. Those who answered ‘no’ to both questions were considered ‘disloyal’, and many of them were transferred to a different facility. 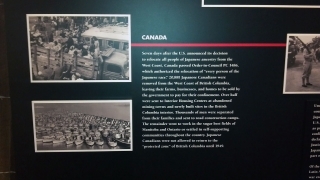 Some were eventually deported to Japan. While most of the detainees were resigned to their fate, there was some resistance. A protest which drew several hundred grew deadly after the crowd surged forward and the guards fired wildly at them, killing a 17 year old boy, fatally wounding another man, and injuring nine others. 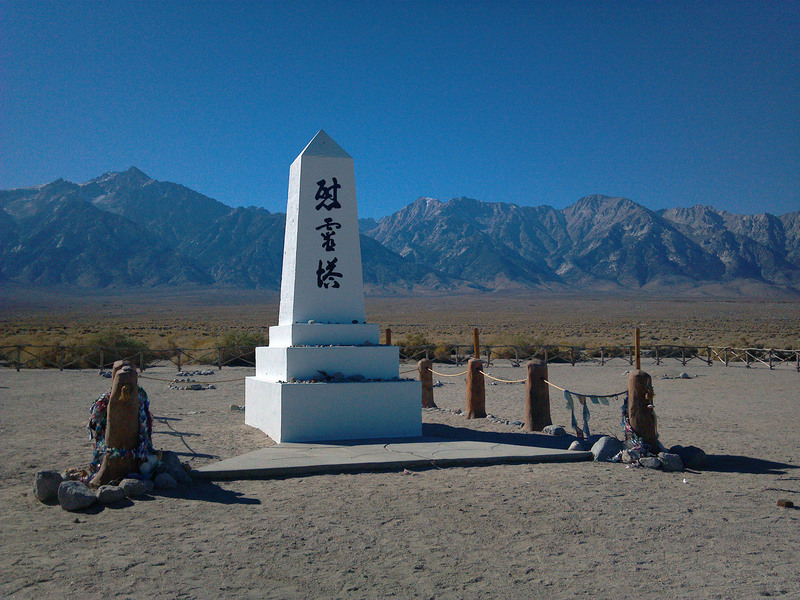 Not all of the time spent at Manzanar was full of despair. People made new friends, fell in love and got married. 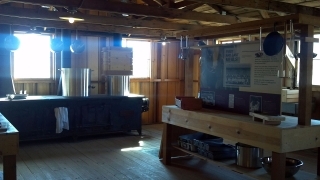 They made the best of their situation by organizing clubs and groups, playing sports, running a newspaper, and cultivating lush gardens and lawns. 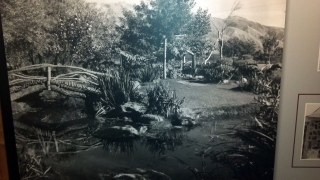 In the span of months, they transformed the bleak, arid environment with Japanese-style gardens, complete with bridges over ponds. It gave them a sense of hope and something else to focus on. 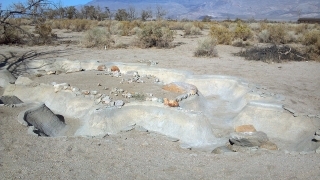 Signs indicated that the ruins of these gardens were still standing outside, so I decided to explore them. On my way out, there were several exhibits tying this event to other struggles immigrants have faced in recent years, including inspirational quotes by the founding fathers and other historical figures. 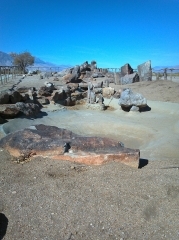 Outside, I began to walk across the fairly large complex. I ran across these rebuilt barracks, showing what the lodging was like. Inside there were simply beds. Another building was set up as the mess hall, the sounds of a kitchen, dishes clattering and the mumble of a crowd playing in the background. 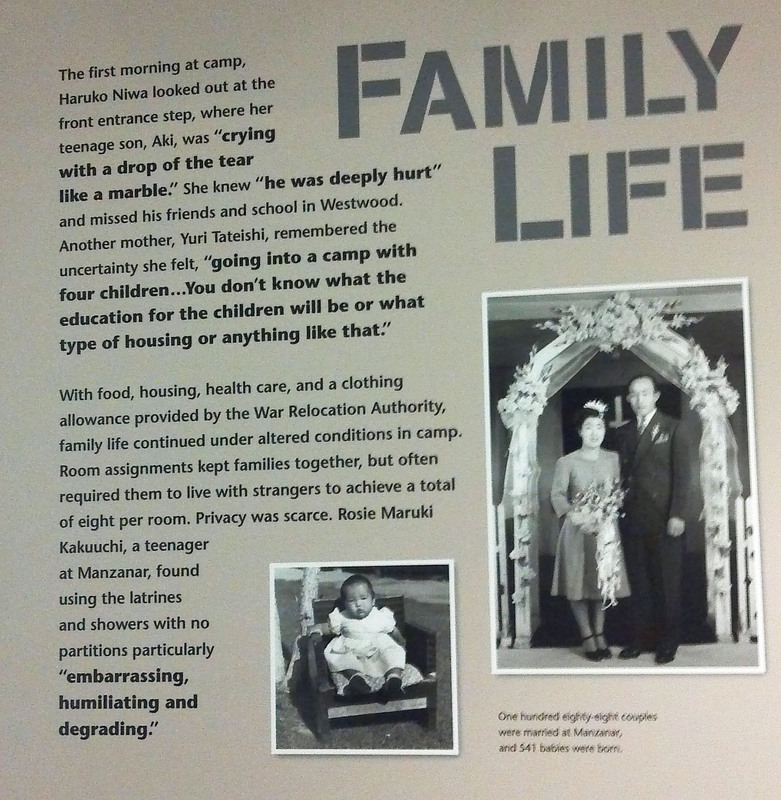 Newspaper clippings reported that the internees grew vegetables in an attempt to make the camp self-sustaining, even managing to get a sizeable shoyu and tofu production facility up and running. Further along were these gardens, a hollow shell of once-vibrant life. 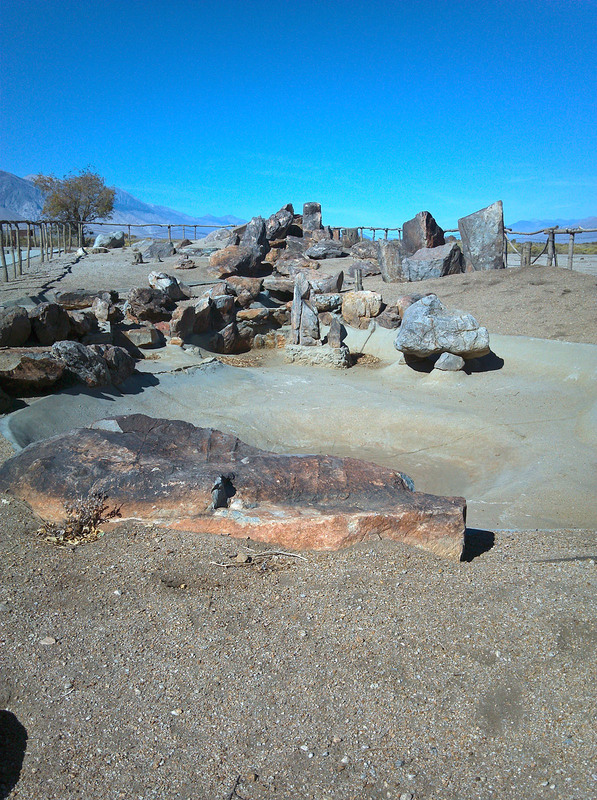 I tried to imagine what they were like surrounded by lush greenery, a pleasant respite from the heat of the desert. There were a number of them scattered around. The hospital wards, now merely foundations, gave me pause. It must have been terrifying to catch an illness here, especially given the rudimentary services available when the camp was new. 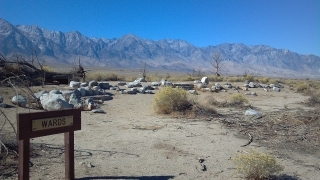 This camp is in the middle of nowhere. Nearby was the cemetery. 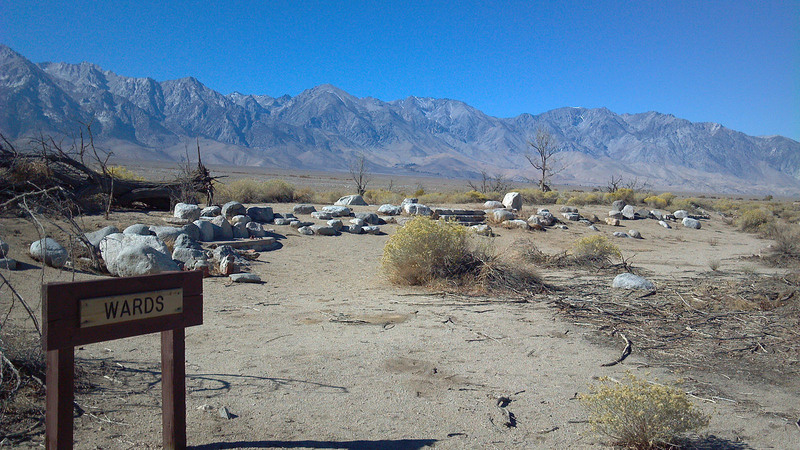 All but a few of the bodies were removed once the camp was closed. 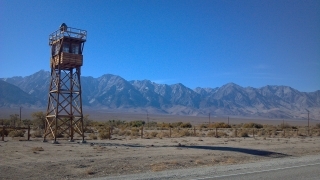 Crafted by the internees and paid for by donation, the monument bears the inscription “soul consoling tower” on the front. 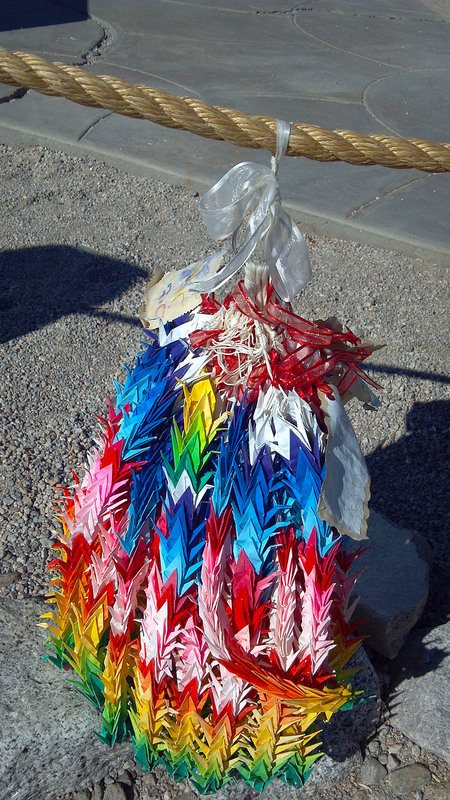 Visitors frequently leave offerings here, including origami cranes and items of personal significance. I found these gorgeous rainbow-colored cranes in a bouquet nearby. 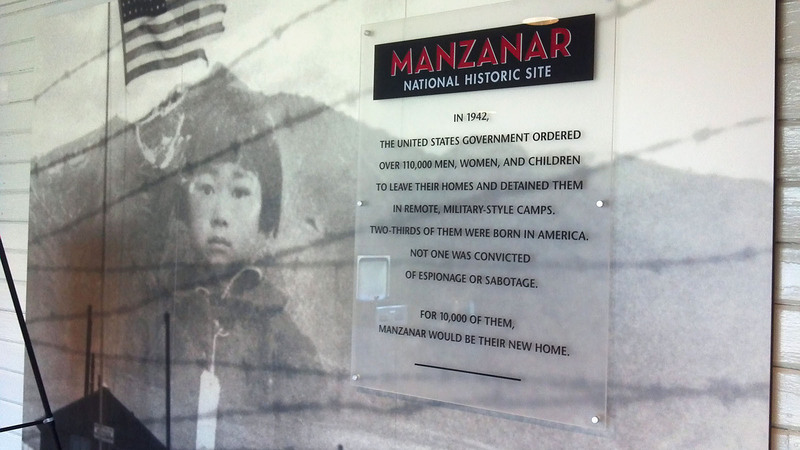 Manzanar gave me a lot to think about. 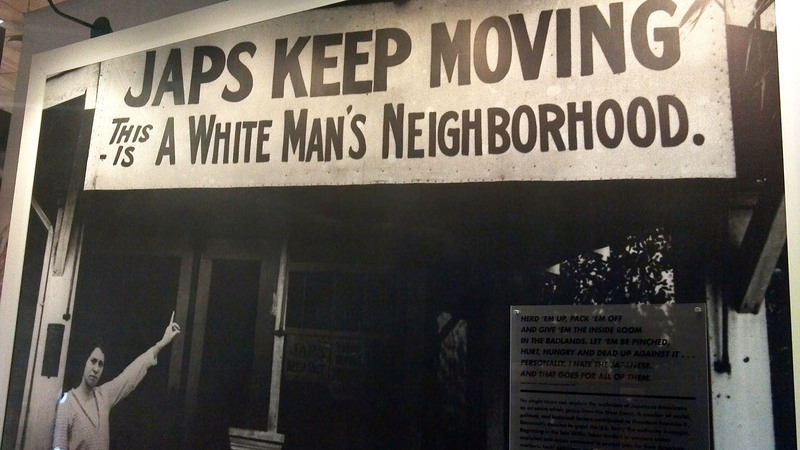 Those who ignore the past are doomed to repeat it, and the growing encroachment of xenophobia and disregard for constitutional rights is a troubling bellwether. Hopefully we won’t repeat our mistakes. The site did provide some hope, even in adversity the people here managed to laugh, love, and create beauty which survived even the demise of the camp itself. 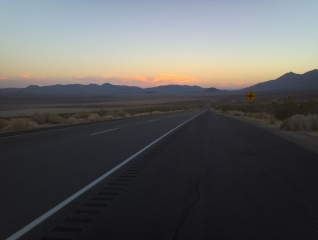 My mind clouded with these thoughts, I made my way back to Lone Pine and reassured Nip that I hadn’t met my doom in Death Valley. He suggested that I check out a place nearby called Fossil Falls for camping, and armed with directions, I set off into the fading light in search of it. 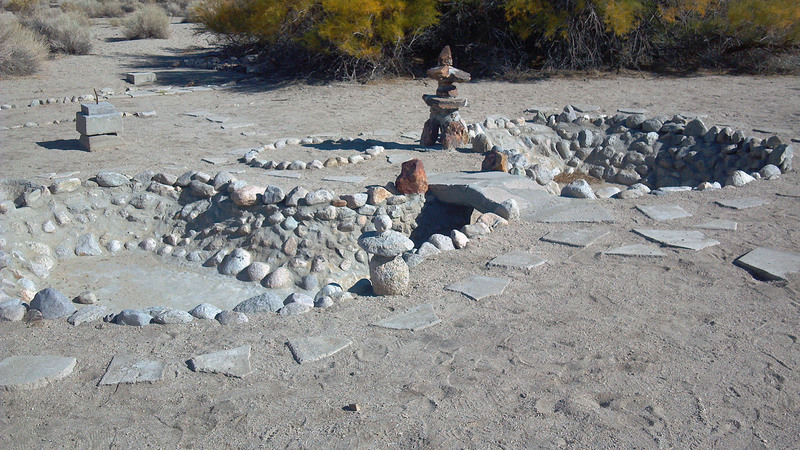 The turn off was fairly easy to spot once I knew what to look for, and it was conveniently near the highway. I managed to assemble my tent before it got completely dark, ate dinner, and slept. 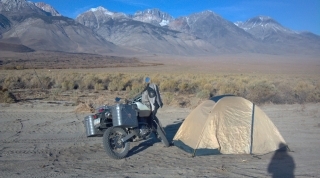 My only company was a single RV on the opposite side of the camp, so I felt like I had the place to myself.